Over the years the American writer Emma Larkin has spent traveling in Burma, she has come to know all too well the many ways this police state can be described as "Orwellian." The life of the mind exists in a state of siege in Burma, and it long has. The connection between George Orwell and Burma is not simply metaphorical, of course; Orwell's mother was born in Burma, and he was shaped by his experiences there as a young man working for the British Imperial Police. Both his first novel, Burmese Days, and the novel he left unfinished upon his death were set in Burma. And then there is the place of Orwell's work in Burma today: Larkin found it a commonplace observation in Burma that Orwell did not write one book about the country but three—the other two being Animal Farm and Nineteen Eighty-Four. When Larkin quietly asked one Burmeseman if he knew the work of George Orwell, he stared blankly for a moment and then said, "Ah, you mean the prophet." 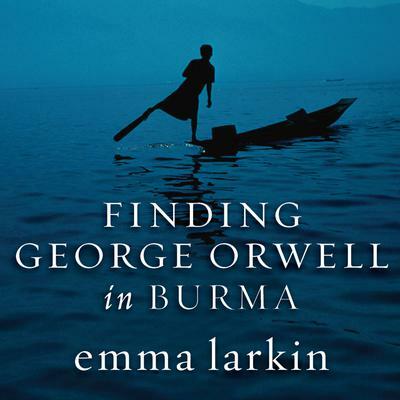 Finding George Orwell in Burma is the story of the year Larkin spent traveling across this shuttered police state using the life and work of Orwell as her guide. Traveling from Mandalay and Rangoon to poor delta backwaters and up to the old hill-station towns in the mountains of Burma's far north, Larkin visits the places Orwell worked and lived and the places his books live still. She brings to vivid life a country and a people cut off from the rest of the world, and from one another, by the ruling military junta and its network of spies and informers. Orwell's spoor leads Larkin to strange, ghostly traces of the British colonial presence and to people who have found ways to bolster their minds against the state's all-pervasive propaganda. Orwell's moral clarity, hatred of injustice, and observant gaze serve as the author's compass in a less tangible sense too: they are qualities that also suffuse this, her own powerful reckoning with one of the world's least free countries.